The Central Bank announced its overnight rate target Wednesday. 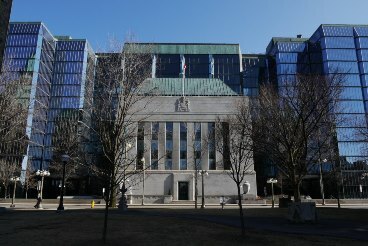 The Bank of Canada is maintaining its target for the overnight rate at 0.5%. Economic growth is now projected to be lower than previously forecast in July’s Monetary Policy Report. “This is due in large part to slower near-term housing resale activity and a lower trajectory for exports. The federal government’s new measures to promote stability in Canada’s housing market are likely to restrain residential investment while dampening household vulnerabilities,” the Bank said. Export data is improving, according to the Bank, but growth will be slower over the next two years than previously forecasted, due in part to lower global demand. Household spending is on the rise, as well as employment and incomes outside energy-reliant regions. The Bank forecasts real GDP growth of 1.1% this year and “about” 2% in 2017 and 2018. It now projects the economy will return to full capacity by mid-2018, which is much later than the original forecast of July 2016. “Given the downward revision to the growth profile and the later closing of the output gap, the Bank considers the risks around its updated inflation outlook to be roughly balanced, albeit in a context of heightened uncertainty,” the BoC said. “Meanwhile, the new housing measures should mitigate risks to the financial system over time.